Heat oven to 350°F. Mix butter, 1 cup flour and 1 tablespoon sugar. Press evenly in ungreased square pan, 9x9x2 inches. Bake 10 minutes. Mix egg yolks, 1 cup sugar, 2 tablespoons flour, the salt and half-and-half in large bowl. Stir in rhubarb. Pour over hot crust. Bake 45 minutes. Beat egg whites in medium bowl with electric mixer on high speed until foamy. Beat in 1/3 cup sugar, 1 tablespoon at a time; continue beating until stiff and glossy (do not underbeat). Beat in vanilla. Spread over rhubarb mixture; sprinkle with coconut. Bake about 10 minutes or until light brown; cool about 30 minutes. Cut into about 3-inch squares. 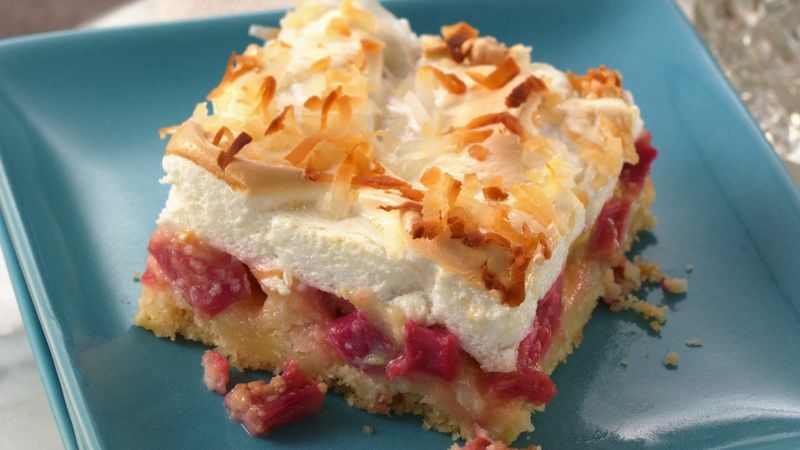 You can substitute 2 1/2 cups of frozen unsweetened rhubarb, thawed and well drained, for the fresh rhubarb.